for nearly 10 years I have been a pipe smoker while I own a handful of traditional briars and get along with them, there is always one pipe I always end up going back to, that is the humble falcon pipe. 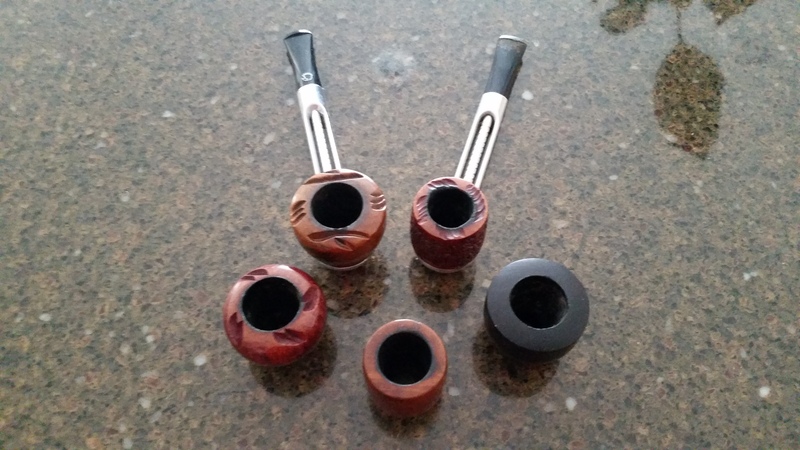 Now I know falcon pipes are about as far away from the norm as you can get and that they are quite the opinion splitter, having read opinions from both ends of the spectrum I thought I would share my thoughts, these are mainly my own thoughts and ramblings but also to maybe help those of you who may be sitting on the fence. There are many variations of the system pipe on the market from peterson to the 6 & 9mm filter pipes, I can attest whole heartedly that the falcon system works and works everytime, no matter how much of a wet smoker you are it is an easy feat to smoke to the bottom of the bowl every time. Given it looks complex it is actually a very easy pipe to take care of and maintain, I'm smoking a falcon bowl now that got when I very first started smoking a pipe. So now time for a more in-depth look. first off we have the stems. the natural, extra and hunter stems offer no difference in smoking qualities, only aesthetics, having had experience with all three my preference is the curved and bent models, these make for easier clenching, and they keep the collect moisture away from the mouth. The straights, although I do smoke them on occasion, if you are a clenched and incline your head the wrong way, the resultant mouth full of moisture is utterly vile, this can be easily remedied by removing the bowl from time to time and swabbing out the goo. the international, in kind of still on the fence with this one, given how a normal falcon stem gives a cool dry smoke, I see the addition of a filter a bit pointless, aesthetically though they do look good and work just as good as a regular falcon stem. falcon offer 8 bowl shapes, and again I have had experience with them all, they come in 2 formats regular and Hunter, regular bowls, come in a brownish shade, but this can differ from time to time, unless you get a rustic bowl you will spot fills on the regular bowl, these in no way hinder the bowls performance but if you are all about the looks then I would advise to look at them in person rather than taking pot luck on the net. the hunter on the other hand is a blonde shade and higher class of briar with no fills in site, these perform to the same high standards as the regular bowls, and are more aesthetically pleasing if you are after very little to no fills. although named a billiard it looks more like an acorn, I find the walls of these too thin and the bowl itself on the small side, I generally stay away from these as unless you a slow smoker, this one heats up fast. a straight pot style bowl, although roughly the same size as the billiard, it has substantially thicker walls, and these bowls are perfect for flakes, and take quite a bit of effort to make warm. an odd shape, it kind of looks like a double spool, quite thick walls so perfect for hot burning tobaccos and aromatics. reminds me of an upside down Rhodesian, with very substantial walls, perfect for vapers and latakias, given the thick walls and good fill you get from one, an ideal outdoor choice. looks a bit like a squashed tomato, gives a decent fill and again thick walls making it ideal for the outdoors person, I own several of these and find it smokes a broken flake mixture perfectly, unless you really go at it, keeps perfectly cool. the taller brother of the Apple, and performs much the same, gives quite a genorous fill and performs very well. a smaller bowl, but performs well, for its size it has quite substantial walls and perfect for lighter mixtures and smoking twists and plug as you will get a decent smoke but not become wearied by it. All the the above bowls are available meerschaum lined, this is not block but pressed meer and gives quite an odd taste the first few smokes, I find it adds no benefit and makes the internals bowl a lot smaller, especially with the smaller bowls of the billiard, Dublin and bulldog. By all means try one if you must but i find the regular bowls perform just fine. Caring for a falcon is pretty easy work. for one don't try and remove the mouthpiece, it won't come off, the only mouth piece that can be removed is the international. After smoking I swab out the moisture from the sump and run a pipe cleaner down the stem, and through the bowl. Once a month or so I will give the bowls and stems a good swab with either rum, whiskey or brandy to give them a freshen up. You can buy a spray by falcon that cleans the pipes, I find spirits work just as well and the smell from the spray is a bit "industrial" the only time i use the spray is if i have bought an old stem that is really caked in tars and goo. enjoy the read gentlemen and hope I haven't bored you too much. I own 3 and do not regret buying them. Most pipers seem to either "love them" or "hate them". I'm in the less popular "leave them" category. I don't smoke mine nearly as much as I do my other pipes. BUT, there is nothing negative I can say about the Falcon pipes I own. They are just not my style. Call it, personal preference. The Falcons I own all smoke well. They are extremely affordable. They are easily cared for. I recommend every piper should try at least one. I actually prefer the Kirsten pipes from Seattle even though they use a screw through the bowl to attach to the pipe instead of just screwing the bowl itself on the pipe. I find them easier to clean than the Falcon and the construction of the aluminum body produces a cooler smoke. Thank you for the write up many of the facts I did not know especially that all the bowls are available Meerscham lined. Every time I use my Dr Grabow Meerscham lined I wish I had more pipes that were. When I go to the NASPC show next month I'll be looking for a falcon intently. I have all the bowls and stems. My favorite bowls are two corn cob bowls I purchased from @DGErwin11. I don't own one, but feel I am better informed if I decide to take the plunge. Nice write up @craig ! I love my Falcons. I abuse them more than my cobs. Every time they clean up wonderfully. Sure, they're no artisan pipes, no bone, silver bands, Birdseye, etc. They are however an excellent choice for a nicotine delivery device... Wish they were cheaper though. you really can't go wrong mate, even if you just use it for like yard work or something similar, if you drop or ding it you arent going to get that feeling of dread. on a personal note I wouldn't hunt the meer lined bowls out intently, I tried on and it was my thing, it isn't block meer it's pressed meer, in other words meer dust mixed with resin and I found it gives a funky taste. By all means try one you may find you get on better with it, I guess one man's trash is another's treasure. I just haven’t been able to get into Falcons. I just don’t like the look of them. 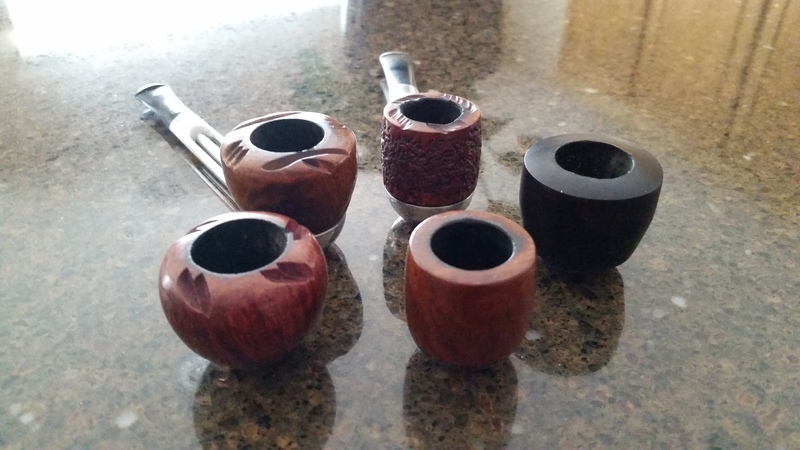 I have about a dozen Grabow Vikings that I liked when I smoked them. I tried a Falcon and didn't see any improvement so I gave it away. I smoke one of my Kirstens if I feel like smoking a metal pipe. which is understandable, I will be the first to admit in most people's books it will never win any beauty awards but it more than makes up in smoking quality. One of the best things I find with them....no oxidation on the mouth piece, but falcon also do a range of traditional briars called the falcon cool way....they take the 6mm filter like the international and they are actually cheaper than the regular falcons but offer outstanding smokes for the price. highly agree, it's like I live in the north of England if I see a pipe smoker you can bet your life it will be a falcon they have in there jaws, I think it's almost a requirement that if you are a northern pipe smoker you must own at least one falcon. I like the three carved bowls, incidently last year falcon released a new line of bowls, it's the same I shapes as listed above, but they have ribs all along the bowl.